NOTE: Our listings are rather lengthy. They not only describe this particular car but also some history of the make/model, considerations in buying a classic car, and facts about our company. However, we continually hear from out-of-state / out-of- country buyers (many of our clients) that they prefer the level of detail that we provide. However, if you are not prepared to read the full listing, please scan the “Specifications” below along with viewing the PHOTOGRAPHS at the bottom. If you’d prefer, please call us at 925-846-1451 and we’ll gladly discuss the VW and answer any questions over the telephone, including our “Buy it Now” policy. Yes, the VW can be purchased prior to the end of the eBay auction. This car is offered at a realistic price and, unlike bidding on cars in an auction environment, you will have the benefit of extensive information and history on the car prior to making a buying decision. Equally as important is the fact that Classic Cars Ltd. has been in business for 25+ years and enjoys an excellent national / international relationship with close to ~1,000 positive eBay feedback responses. Answer any questions over the telephone and take the time to guide prospective customers through the buying process (925-846-1451). Assist with locating a quality, suitable transporter at very competitive prices. Provide proof that we are licensed, bonded (for the financial transaction), fully insured, and operate from an established showroom environment. Thank you again, please let me know if I can be of assistance. 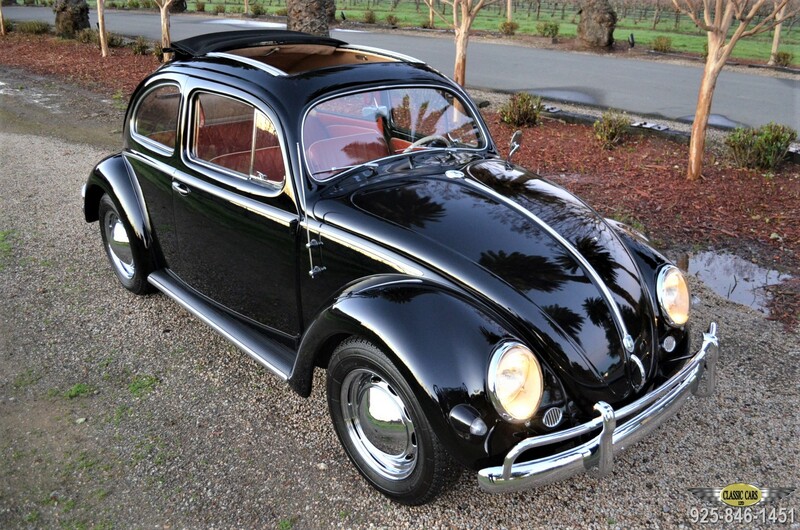 We have always loved the early VW Beetles, especially the “Ovals”, and believe they represent the purest form of the classic VW “Bug.” While the early VW’s are desirable, this particular 1956 VW’s history puts it in a league of its own. Not only has the VW always been in Northern California, the car has been owned by a 3 owner’s since 1980 (one of the owner’s had the car for 2 years and sold to his sister who owned the VW for 1 year). The other owner had possession of the car for 30+ years, stored in a climate controlled dealer showroom! 1983 – The VW is sold to the owner of a Mazda dealership in nearby Redwood City, CA where it is on display in the showroom for close to 30 years. In the 2010 time-frame the cars owner / owner of the Mazda dealership, passes away and the two cars in his collection, this VW and an MGTD are sold as a package deal to a buyer in Hayward, CA. 2010 – Mr. A. receives a call from a high end upholstery shop in Hayward that he is familiar with due to his restoration of other vehicles including Porsche 356 cars. The caller remembers that Mr. A, owned the car in the 1980’s and, based on its condition, originality, and rarity as a ’56 ragtop (“slide-back”) says “Mr. A. we have a 1956 VW that looks like the car you had ~years ago. It’s black with red interior and the guy is having us do some work.” Mr. A rushes to the upholstery shop confirms that it is in fact “his” car, and immediately begins negotiations with the owner to buy back the VW. After lenghty discussions/negotiations, he acquires the car and begins to freshen the restoration on the incredibly original, well cared for VW. Note: Mr. A’s notes indicate that the car had been driven approximately 4,300 miles from 1983 – 2010. 2010 to Present – Under Mr. A’s ownership, the restored/original VW is completely freshened with a high level of attention to detail. This effort included a considerable effort and attention to detail to bring the car to a high standard both cosmetically, and mechanically. Receipts will be provided to the cars new owner. Multiple photos of the previous owner when he first owned the car in the early 1980’s (1982) with the car at a dealership that wanted to purchase the car at the time (mileage shown as 9,567 (showing on the odometer) 0r 109,567. Previous owner reported to the current owner that the mileage shown today is accurate at 15,047 (showing), 115,047 actual. He beleives the car has traveled ~14,000 miles since the 1980’s. As a lifelong California car, the VW was an excellent candidate for a comprehensive restoration due to its extremely straight body, original panels, and lack of rust. The previous owner reported that the vehicle retains most of its original panels with the exception of the rear fenders that were replaced with quality VW OEM replacement parts in the 1980’s. . Photos (will be provided to the new owner) show the car with its original yellow and black license plates, correct for when the vehicle was sold in 1956. Subsequently, the car received personalized plates resulting in a change to the blue / yellow license plates. A 1987 California registration document supports that the blue/yellow plates have been on the car for 30+ years. Unlike cars from inclement weather regions that have significant rust, restoring a rust free car with excellent “bones” results in a considerably better final product. This 1956 VW is certainly evidence of this philosophy. Frankly, this car looks even better in person than in the photos due to the challenges associated with photographing a black vehicle. Finished in a classic ebony paint with red leatherette interior and proper color coordinated carpet and headliner, the car is absolutely striking. The quality of the exterior is as high as we have seen and would be described by most as “show level” quality. We ask that you pay particular attention to the photos of the inner fenders, engine compartment, front trunk area, and other areas as examples of the commitment to excellence in the refurbishment of this rare, original VW. Unlike many inexpensive re-paints, or VW’s that are built to “flip”, this car was restored for the owner’s enjoyment and the thought that he would keep the car forever. Unfortunately, life’s realities resulted in the reluctant sale of the VW. The interior is as lovely as the exterior and was completed with a commitment to quality, and attention to detail. No shortcuts were taken and the entire interior was redone at the time the car was disassembled for restoration and included new seating material, matching door panels (front and rear), new carpet, restoration of the dash / steering wheel, all new rubber trim, and much more The seats are excellent as are the door panels. The immaculate engine compartment reflects the “engine out” restoration and engine rebuild. Details include the proper engine stickers and upgrades over the stock VW including powder coating of many engine components. It is safe to say that the engine compartment of this Beetle shows as new and, several who have seen the car would say better than new! Painstaking efforts have been made to maintain the VW’s stock, 1956 appearance. The car is fitted with a period correct, highly detailed engine, and freshly rebuilt complete transaxle. The 6-Volt system was retained and many of the electrical components have been replaced within the past few years. This is also true for the fuel system from front to back, brakes, exhaust, highly detailed engine (rebuilt within 5,000 miles), and too much other work to detail. The only items that have been added to enhance the appearance of the VW are a matching set of Porsche style chrome wheels & hubcaps mounted to a matching set of Michelin XZX 165SR15” tires with less than an estimated 1,000 miles. Finally, while the cars suspension has been lowered by an inch, or so, it could be brought back to the stock ride height should that be the new owner’s preference. Personally, we think the VW has just the right stance and looks great! The VW has been maintained and service regularly by a local VW specialist with 30+ years’ experience with VW beetles. Tune-ups, oil services and other needed preventative work has been completed including a complete oil service and serviced and file documents the professional rebuild of the engine that makes the car a pleasure to drive without having a negative effect on the original appearance and charm of the VW. The VW brings back wonderful memories of one of our first car, a 1967 VW Beetle, but only better and much more unique / collectible. The car is great fun to drive and is totally reliable, fuel efficient, and receives an unbelievable amount of attention from the large number of previous owners who enjoyed Beetle ownership in years past. The car starts immediately with a pull of the dash mounted choke, when cold, and warms up quickly. The car runs very well with no noise in the engine, excellent clutch, and no indications of mechanical issues. All of the operating systems are completely functional including lighting, horn, speedometer/odometer, and radio. It shifts well through all of the gears, the clutch engages properly and without slippage, and the brakes stop the car straight and sure. The emergency brake is properly adjusted and fully functional. The steering is tight and precise and the car is free from wind noise due to the replacement of virtually all of the rubber seals when the car was restored. All of the lighting systems are functional. The VW represents a properly restored car that can be enjoyed as a very high end “driver”, or an occasional use car. If taken to a local show, the car will undoubtedly garner considerable attention from admiring fans along with the possibility of recognition from show judges. Passed the California required safety inspection for working wipers, turn signals, lights, brakes, etc. Length : 160.2 in | 4069 mm. Width : 60.6 in | 1539 mm. Height : 59.1 in | 1501 mm. Front Track : 50.8 in | 1290 mm. Rear Track : 49.2 in | 1250 mm. The Volkswagen Beetle, officially the Volkswagen Type 1, or informally in the US the Volkswagen Bug, is a two-door, four passenger, rear-engined economy car manufactured and marketed by German automaker Volkswagen (VW) from 1938 until 2003. Volkswagen means literally, “people’s car” in German. The need for this kind of car and its functional objectives were formulated by Adolf Hitler, desiring an inexpensive, simple car to be mass-produced for the new German road network. He contracted Porsche in 1934 to design and build it to his exacting standards. Ferdinand Porsche and his team took until 1938 to finalize it, although the design was based entirely on the work of Béla Barényi, who completed the design in 1925. This is one of the first rear-engined cars. With over 24 million manufactured in an air-cooled, rear-engined, rear-wheel drive configuration, the Beetle is the longest-running and most-manufactured car of a single design platform worldwide. – How much experience do they have with collector cars? – How many positive collector car vehicle sales have they completed (positive eBay feedback)? – How detailed/complete is the description of the vehicle? – Do the photos show details of the interior, exterior, top, chrome, etc. or are they simply “glamour shots” taken from a distance? – Does the seller have a Surety Bond to protect the financial transaction? – What about insurance, licensing by the state, and a local business license? – Does the seller (if a business) have any DMV (Motor Vehicle) complaints and/or other history of legal action, grievances? – Does the seller enjoy a favorable local and national/international reputation? – Can the seller assist with funding sources, transport and out of state/country sales? – We have been the same, small, California town for over 25 years. We operate a small “brick & mortar”, indoor showroom, and specialize in the sale, consignment, and purchase of sports, high performance and specialty vehicles of all types. We have a particular interest in sports cars and unique vehicles. – The majority of our vehicles come from local, private owners and collectors, and many were sold new in California. We appreciate that rust free cars, with excellent documentation and history are especially attractive to our buyers both locally, and around the country. As a result, we do not purchase our collectible cars from “distressed” sales, such as wholesale auctions, salvage sales, or lien sales. We do not sell vehicles with salvage titles, or those that have a history of significant accident damage or repair. – We have sold hundreds of unique, classic and collectible vehicles and regularly deal with buyers that have not had the experience of purchasing a large (both physically and monetarily) item on eBay, or through an Internet source. Our eBay feedback is 100% positive on all vehicle sales from customers around the globe and is a reflection of our commitment to accurate, complete, and thorough vehicle descriptions. – We have been shipping vehicles for years and have established excellent contacts that are not only high quality but very price competitive. We do not use brokers, terminal shipping or other discount methods. Call us or email for a quote directly to your home or office. We are often able to obtain quality enclosed transportation (the kind of travel this car deserves) for the cost of open shipping. – Please review our feedback on eBay (user name Never22Many) representing close to ~1,000 positive transactions to buyers all over the United States / World. – We are fully insured, bonded, and licensed for collector car sales all over the United States/World. – We frequently sell vehicles to out of State / out of country buyers, and will be glad to provide references for buyers in your area. – As with virtually all collector/specialty vehicles, we find that parts and resources are readily available for this (and most every vehicle), thanks in large part to the Internet. – In addition to the purchase price of the vehicle, California buyers will be subject to sales tax, a documentation fee, DMV transfer fees and license/registration. Out-of-state buyers will be responsible for the purchase price of the vehicle and any local taxes/fees will be the purchaser’s responsibility to pay in their respective state. IMPORTANT NOTE: If the vehicle is delivered or driven in California and driven on California roads, sales-tax, license/registration and transfer fees will be assessed per California law. – While we encourage telephone calls to discuss this vehicle in greater detail and ask that you call us at 925-846-1451 if we can answer any questions about the VW, Classic Car Ltd, or shipping costs to your location. – We welcome inspections of this VW by serious individuals or professional inspectors. Please call at 925-846-1451 to arrange a convenient time. – As with any collectible vehicle of this vintage we are unable to provide a warranty or guarantee of condition. However, we make every effort to accurately represent our vehicles, and highlight both positive items as well as areas that require attention. We ask that prospective buyers consider our eBay history/feedback, standing in the community, length of time in business, and other factors when purchasing a collectible vehicle from Classic Cars Ltd.
– Minor cosmetic issues/flaws may be present on every vehicle (regardless of cost) including small chips, nicks, scratches, etc. that can be seen on even the best restoration, or even a relatively new, used “pre-owned” vehicle. Also, ownership of a collectible / specialty vehicle is more enjoyable if the owner is familiar with the “realities” of these unique cars. Unlike more modern day vehicles, these cars require regular, ongoing care/maintenance and some mechanical knowledge, patience, and understanding can make the experience considerably more pleasant. That said, collector / “specialty” car owners will tell you (emphatically) that they love their cars and wouldn’t trade them for anything!! – The information contained in this description is believed to be accurate but, in some instances, has been provided by the car’s owner / owners or outside sources. As a result, we are unable to guarantee the accuracy of the information. We encourage verification of “numbers” and significant data prior to the purchase of any collector vehicle that you are considering.